A Mom with a Blog: Got Email From 'Kathy Lagoli'?... it's SPAM! If you receive an email from 'Kathy Lagoli'... don't answer it! It is SPAM!!! I wanted to let all my blogger friends know about a SPAM email that is going around. The emails come from "Kathy Lagoli" who seems to be interested in your blog. The sender personalizes the subject line with the name of one of your blog posts so you feel as if you should answer. Thankfully, before I did send a reply, I googled the name Kathy Lagoli and found out that this is pretty widespread SPAM. Re: a mom with a blog: use bottle tops to seal a bag.... great idea! Would you be available to discuss this on the phone ? Hey didn't hear back from you, are you still in business ? You can Google it for yourself if you'd like. I just wanted to spread the word. After searching I found that a lot of others replied as well... even giving phone numbers! The only reason I didn't reply is that I found her first message in my 'spam' folder. If you notice, both emails are 'from' the same name but have different return addresses. I blocked both domain names in my email and if you do the same it should keep it to a minimum... at least I'm hoping. I guess we'll see tomorrow if we have any more messages from her (or whoever it is). It's a shame that they would target bloggers this way. Thank you so much! I just answered one and now I know that she just wasted 5 minutes of my time. Looks like more than a few people replied to her. But who would have thought that someone would spam your blog? Ooh, I hate those emails. I get so much spam everyday it's a joke. Probably because my email is online for everyone to see. Anytime they want you to contact them by phone, use poor sentence structure, or say that they're dying of an incurable disease, you know it's spam. 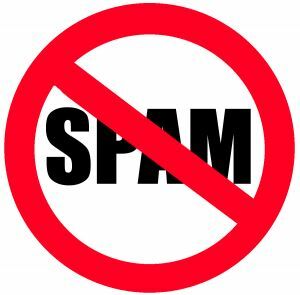 I wonder if there's a way to block individual spam email addresses from sending you stuff... course, then again, it's probably just like spam comments. They alternate between IP addresses, and probably email addresses too. I hate all the spam too and I thought I could recognize it right away. I guess I didnt' think anyone would spam my blog email. Go figure! I try to keep blocking the addresses and even domain names but you're right... they just keep creating new ones. Thankfully I didn't reply, something sounded kinda fishy so I ignored it. I'm glad you didn't reply. I didn't reply either... I'm trying to be more careful. Thanks for visiting my blog. I was just at yours and it's beautiful. I'll be back when I can spend more time. I don't even have a reaction when I receive something like that. So my reaction would probably be: Kathy who?